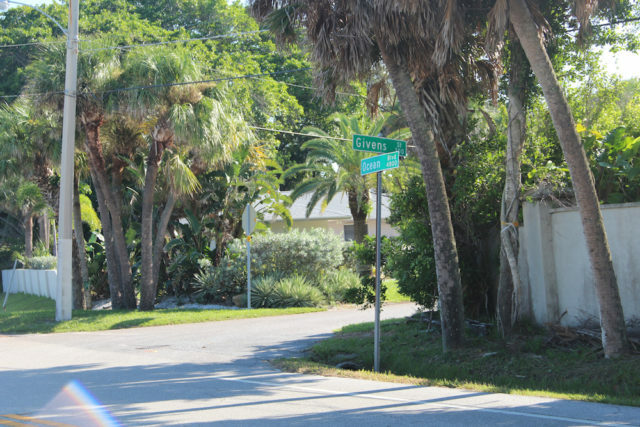 Around mid-October, both north- and southbound drivers on Ocean Boulevard should be alert to new warning lights at the Givens Street intersection, thanks to an initiative prompted by residents of that area and the Siesta Key Association (SKA). Former SKA President Michael Shay told The Sarasota News Leader that the organization received an email in early April about concerns regarding traffic in that vicinity. Explaining that he and his wife and have been Siesta residents for the past 23 years, the email writer pointed out to a situation that, if not addressed soon, surely would lead to someone being seriously injured. 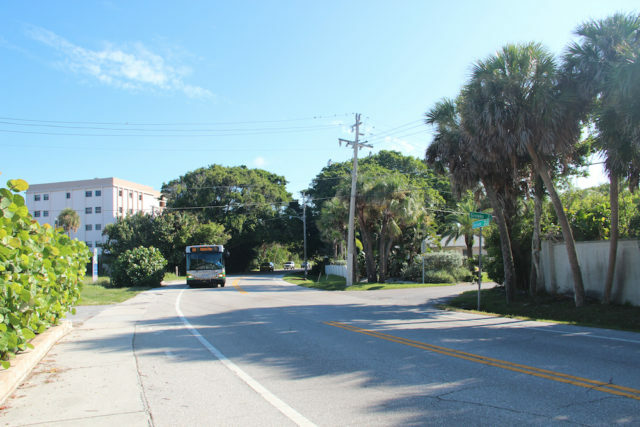 Both pedestrians trying to cross Ocean from Givens and drivers attempting to turn from Givens onto Ocean face traffic headed “around the sharp blind curve on Ocean,” the writer added. “On Ocean Blvd. there is a sign warning drivers of the curve and to slow down, but I would like to think there could be a more prominent sign or flashing yellow light to get traffic to slow down,” he continued. Shay promised to contact county staff and find out what could be done to ameliorate the situation. Shay told the News Leader that after he stepped down from the SKA board in May, he continued to work on the issue because he had handled it from the beginning. On Aug. 30, Shay received an email from Robert Fakhri, the county’s manager of traffic engineering and operations, who apologized for the delay in responding. Fakhri explained that staff had completed its review of the intersection and had recommended the installation of a flashing beacon for traffic headed both north- and southbound. County spokesman Drew Winchester told the News Leader by email on Sept. 13 that the solar-powered lights will be installed “in about 30 days,” adding that the cost of both beacons is $4,500. Mike Driscoll, owner of The Fish Hole in Lakewood Ranch and the Bradenton Beach mini golf course, provided a photo of the landscaping at the Lakewood Ranch facility. 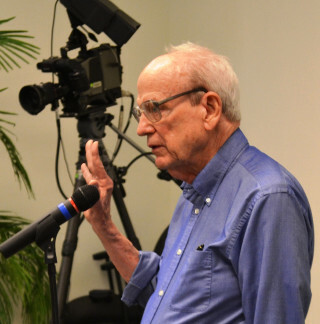 The couple who hope to create an 18-hole miniature golf operation on Siesta Key’s Calle Minorga appeared before members of the Siesta Key Village Association (SKVA) this month, seeking a letter of support if the organization’s board felt that appropriate. “We see this as just an adjunct to all your businesses here,” Mike Driscoll explained of the concept. No neighborhood workshop date has been set yet, Driscoll told the News Leader after the Sept. 6 meeting, but he let the SKVA members know that their support during that session would be much appreciated. Driscoll said he and his wife, Debbie, wanted to introduce themselves to Village merchants. 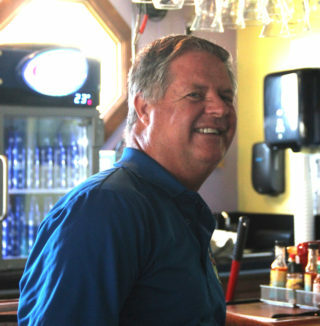 If any SKVA members have visited their Fish Hole operation on Lakewood Ranch’s Main Street, he continued, they have seen “we build a very [natural] looking place. Our golf courses kind of look like a park,” Driscoll added. In Lakewood Ranch, he explained, The Fish Hole works with about 30 businesses to advertise specials for restaurants and shops on its scorecards, encouraging families to visit those places after they play rounds of golf. In response to a question about parking, Driscoll explained that the current plan includes 13 vehicle spaces, two spots for motorcycles and a bike rack, for a total of about 16. 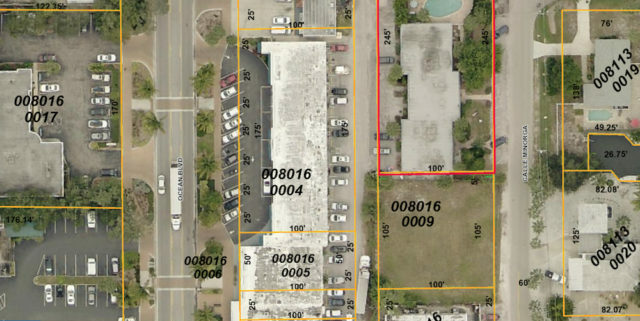 He hopes guests also will be able to park on the side of the street, Driscoll continued, and county staff has suggested the possibility of parking in the alley behind the property. County staff members said no traffic study would be needed, he noted, because they agreed with Driscoll that the golf course would not be anticipated to be a destination attraction. Robert Lincoln, the Sarasota attorney representing Driscoll in the development plan, told the News Leader in August that the expectation is that people would play golf before or after dining and shopping in the Village. Driscoll said during the SKVA meeting that he has been working with county staff on the necessary rezoning and special exception necessary for the project. Michael Shay has volunteers lined up to participate in the International Coastal Cleanup on Sept. 17, he reported during the Sept. 6 SKVA meeting. They will be working in conjunction with the Keep Sarasota County Beautiful (KSCB) staff on this global effort to clear trash and other debris from waterways, he said. Because so many people in the past have been interested in participating in the event, he noted, KSCB has set aside a second day for the initiative. That will be Oct. 22. Shay and his group will be working on Siesta Key Public Beach, he added. Wendall Jacobsen, general manager of Beach Bazaar and the SKVA’s president, told Shay he would be happy to donate sunscreen from that business for the volunteers, as he has in the past. Anyone interested in volunteering for the cleanup may contact Keep Sarasota County Beautiful by calling the county Contact Center at 861-5000 or visiting http://www.scgov.net/kscb. The hours on Sept. 17 and Oct. 22 are 8 a.m. to noon, with locations available throughout the county, according to a county flyer. The rain dates for the event are Sept. 24 and Oct. 29, the flyer notes. Peter van Roekens, chair of Save Our Siesta Sand 2, reminded SKVA members last week that the nonprofit organization will be among the charitable entities in Sarasota County participating in the 2016 Giving Challenge through the Community Foundation of Sarasota County. The ’round-the-clock event will begin at noon on Sept. 20 and conclude at noon on Sept. 21. The first $100 of any contribution will be matched by the Community Foundation in collaboration with the Patterson Foundation, he noted. Save Our Siesta Sand 2 has been raising funds in the event that it has to file a lawsuit to prevent the dredging of Big Sarasota Pass to renourish South Lido Beach. The Florida Department of Environmental Protection has until Oct. 1 to decide its next step in review of an application for the $19-million project that was submitted in March 2015 by the City of Sarasota and the U.S. Army Corps of Engineers. 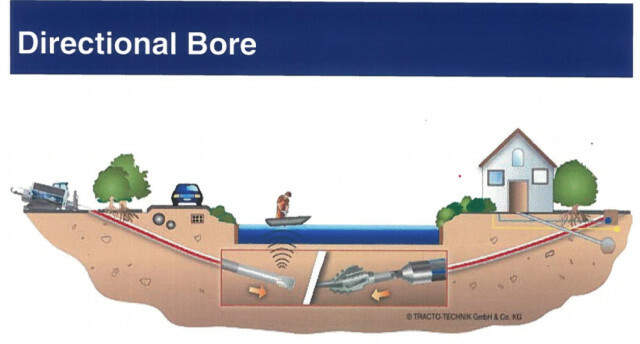 Van Roekens and SKVA Vice President Mark Smith have estimated it could cost as much as $250,000 if the nonprofit has to pursue a legal challenge to prevent the dredging of the pass. Russell Matthes, an SKVA board member, noted during the Sept. 6 meeting that hundreds of organizations will be participating in the Giving Challenge. Matthes also is a board member of Sarasota in Defense of Animals (SDA), which will be a participant in the Sept. 20-21 event, as well. Last year, the Giving Challenge website says, more than $7 million was raised to benefit 449 nonprofits, each of which has been vetted by the Community Foundation. During his routine update on Village upkeep, which was part of the Sept. 6 SKVA meeting, Michael Shay pointed out that Buccaneer Landscape Management has dropped to a four-day-a-week schedule, which it will maintain until February. That correlates to the official end of the summer season, Shay indicated. He serves as the liaison between the SKVA and the Siesta Key Village Maintenance Corp., which pays for the upkeep. In response to a question, Shay said Sunday is one of the days a Buccaneer crew is in the Village, which means workers collect garbage that day from the cans in the area. SKVA President Wendall Jacobsen noted that Buccaneer’s employees “did a great job” picking up trash before then-Tropical Storm Hermine passed by Siesta Key the previous week. Although some issues arose with the garbage collection in July, Shay continued, he kept a close eye on the situation in August. “There hasn’t been a [recent] problem,” he added. In a related matter, Shay mentioned the Aug. 23 accident during which a woman driver apparently lost control of her vehicle and plowed into the south island, across from Foxy Lady. The BMW “took out everything” in that island, Shay reported, including a palm tree. He suggested that SKVA Vice President Mark Smith, who is a Maintenance Corp. board member, check with county staff about replacing the tree. His understanding, Shay continued, is that the tree was not considered county property, so the county would not replace it. 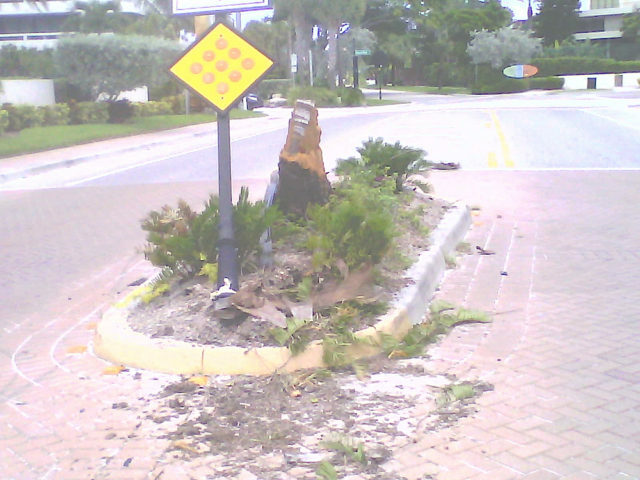 When Smith asked what is considered county property, Shay replied, “I know the [traffic island] signs are.” However, he continued, Lisa Cece, the special district coordinator for the county who oversees Village maintenance on behalf of the county, indicated that the tree was not a county responsibility. Shay added that a Sheriff’s Office deputy did file a report about the incident. “So you may want to follow up on that,” Shay told Smith. However, the project was expected to remain on hold on the Siesta end as staff kept monitoring noise and settlement issues on the island that appear to be related to work already done. Staff has set a goal of completing the project by late December 2017, so the Siesta Key Wastewater Treatment Plant can be decommissioned. I suppose that if the mini golf course is not (as its developers assert) a “destination” attraction there would be no need to promotionally advertise its existence if built ? ?